Zucker is the man who brought America The Jay Leno Show, supersized sitcoms, and, most disastrously, Ben Silverman. Sure, symptoms of the Peacock’s demise were present even before he took over, as powerhouses Friends and ER were nearing the ends of their runs. But there’s simply no getting around the fact that he oversaw NBC’s deep descent to also-ran status, and then proved himself totally incapable of reversing its decline. Of course those who know him or felt professionally scarred by his choices would question the wisdom of putting him in charge of reviving a channel that once billed itself, sans irony, as the World’s Most Important Network. And yet, even for those of us who will never forgive Zucker for cynically (and stupidly) knifing Conan O’Brien in the back or for axing Southland, it’s worth putting aside the bitterness for a moment to acknowledge another truth about the man: Before he ruined NBC’s entertainment division, Zucker was rightfully known as something of a news wunderkind. Putting him in charge of an organization that’s core mission is live, breaking news kind of makes sense. First, in case your knowledge of Jeffrey Adam Zucker begins with his decision to put Fear Factor on the air, a quick biographical note: At the age of 26, just a few years after graduating from Harvard, Zucker was tapped to run NBC’s storied Today show, which at the time (late 1991) was regularly lagging behind ABC’s Good Morning America in the ratings. He had great story sense, was a fierce competitor for guests, and also innovated by reviving the street-side crowds via Today’s glass-enclosed studio and morphing news and entertainment with the show’s much-copied concert series. All this amped up the energy level of the morning daypart, and Today quickly became competitive with GMA; by 1996, the show took over the No. 1 spot in the ratings and held on to the lead until this past spring — an astonishing sixteen-year winning streak. Zucker doesn’t get all the credit of that: Anchors Matt Lauer, Bryant Gumbel, and Katie Couric played a big part, as have Zucker’s successors. But Zucker created the DNA for the modern Today juggernaut. He built that. And when he ran the show on a day-to-day basis in the nineties, Today was truly Must-See TV for news consumers. Zucker’s notoriously short attention span (Hollywood types hated the fact that he would often multitask during pitch meetings) made him ideally suited to shepherd a live two- (and ultimately three- and four-) hour broadcast. And yet, while Zucker’s relations with Hollywood talent were, to put it charitably, awful, his rapport with newsies was just the opposite. I wrote this about Zucker in Variety back in 2000, on the day he was officially named head of NBC Entertainment: “If there’s one thing Zucker’s known for, it’s his incredible skill negotiating the notoriously rocky landscape of egos and paranoia that is a network news division.” Indeed, unlike the horrendous way NBC handled Ann Curry’s recent exit from Today, Zucker flawlessly executed the transition from Bryant Gumbel to Matt Lauer. He got along so well with Katie Couric, whose ascent at Today coincided with his own, that when she decided to launch a daytime talk show, she partnered with Zucker again, making him executive producer. (We doubt Conan will suddenly opt to work for Zucker again at CNN.) While it probably wouldn’t be hard to find some NBC News alumni who don’t think much of Zucker, for the most part, he was revered and respected by those who worked for him at that division. And it’s not just Today that benefited from Zucker’s news expertise. Zucker engineered the transition from Tom Brokaw to Brian Williams at NBC Nightly News in 2004, helping maintain the broadcast’s dominance in the ratings. And what’s more, MSNBC transformed itself from also-ran to credible Fox News alternative during Zucker’s run as head of parent company NBCUniversal. MSNBC chief Phil Griffin (and dearly departed Keith Olbermann) obviously get much of the credit for the latter turnaround. But if Zucker gets the blame for Ben Silverman, he deserves the glory for letting Griffin get in touch with his inner leftie. Of course, none of this means Zucker is a sure thing to turn around CNN. The gimmicks and tricks that worked so well in morning TV might not play at an organization that, despite being a relatively young 32 years old, is known for the sort of vicious internal politics and Byzantine bureaucracy one usually associates with the Kremlin. 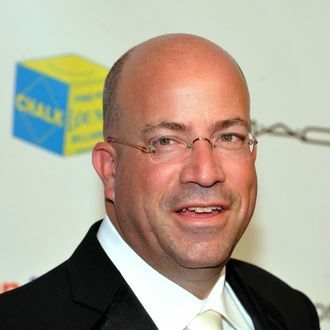 Zucker was used to being the man at NBCUniversal; at CNN, he’ll answer to executives at TimeWarner. Plus, if Zucker decides to run the news channel the way he oversaw NBC Entertainment, by “managing for (profit) margins,” you can expect loud howls of protests from CNN insiders and news purists who’ll howl if he replaces CNN’s investigative unit with, say, News or No News with Howie Mandel. But even if his success is hardly assured, the idea of Jeff Zucker running a proud but deeply troubled news organization like CNN isn’t a joke. Who knows: If Zucker can rekindle some of the manic energy and unconventional thinking that made him a 26-year-old news phenom at the dawn of the Clinton era, CNN might actually stand a chance of being relevant once more. Let’s just pray he doesn’t decide to supersize Wolf Blitzer.